Banned after promising research in the 1940s, '50s, and '60s, the use of psychedelics as therapeutic catalysts is now being rediscovered at prestigious medical schools, such as Harvard, Johns Hopkins, NYU, and UCLA. 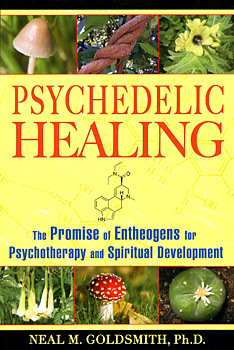 Through clinical trials to assess their use, entheogens have been found to ease anxiety in the dying, interrupt the hold of addictive drugs, cure post-traumatic stress disorder, and treat other deep-seated emotional disturbances. To date, results have been positive, and the idea of psychedelics as powerful psychiatric--and spiritual--medicines is now beginning to be accepted by the medical community. Exploring the latest cutting-edge research on psychedelics, along with their use in indigenous cultures throughout history for rites of passage and shamanic rituals, Neal Goldsmith reveals that the curative effect of entheogens comes not from a chemical effect on the body but rather by triggering a peak or spiritual experience. He provides guidelines for working with entheogens, groundbreaking analyses of the concept--and the process--of change in psychotherapy, and, ultimately, his own story of psychedelic healing. Examining the tribal roots of this knowledge, Goldsmith shows that by combining ancient wisdom and modern research, we can unlock the emotional, mental, and spiritual healing powers of these unique and powerful tools, providing an integral medicine for postmodern society. Neal M. Goldsmith, Ph.D., is a psychotherapist specializing in psychospiritual development. A frequent speaker on spiritual emergence, drug policy reform, and post-modern society, he lisves in New York.